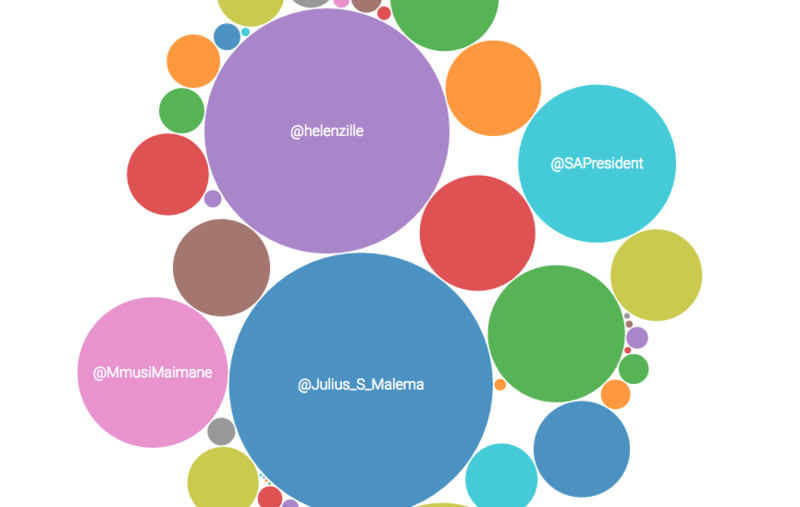 Which SA politicians and parties are big on Twitter? Datablog has been keeping track of what some of the political parties and politicians are up to on Twitter ahead of the local government elections and we’ve discovered that, when it comes to tweeting, the Democratic Alliance is way ahead of the other political parties. With just a few days to go before the local government elections, its @our_DA account had released into the Twitterverse 70 000 posts – an average of 26 Tweets per day – twice as many as @myANC (33 000) – 12 a day – and three times as many as @EFFSouthAfrica (22 700) – 16 a day. Helen Zille (@helenzille), the Western Cape premier and former DA leader, is by far the most prolific tweeter of the politicians. She has sent forth a total of 48 700 tweets (an average of 18 per day) to her 980 000 followers, far more than the party’s current leader Mmusi Maimane (@MmusiMaimane), who has posted 11 800, or an average of 6 a day, to his 371 000 followers. In terms of followers, the leader of the political Twitterati, is @Julius_S_Malema. The Economic Freedom Fighters’s commander in chief has a following of 1.14-million, to whom he sends an average of 6 tweets a day. Our list of political parties and politicians is a work in progress. This graphic uses Twitter’s API, so the numbers update regularly. * Tweets per day is calculated as the total number of tweets / number of days since person/politician joined Twitter.